Any meal that involves the use of the stove top while the side dish is in the oven, concerns us greatly – in a good way! As much as we adore one-pot meals like an Italian chicken skillet, we absolutely love it when oven roasted veggies and grilled steak (or any protein) go hand in hand. It feels very pragmatic and extremely organized to make a complete meal in a matter of minutes, using all that your kitchen equipment has to offer. 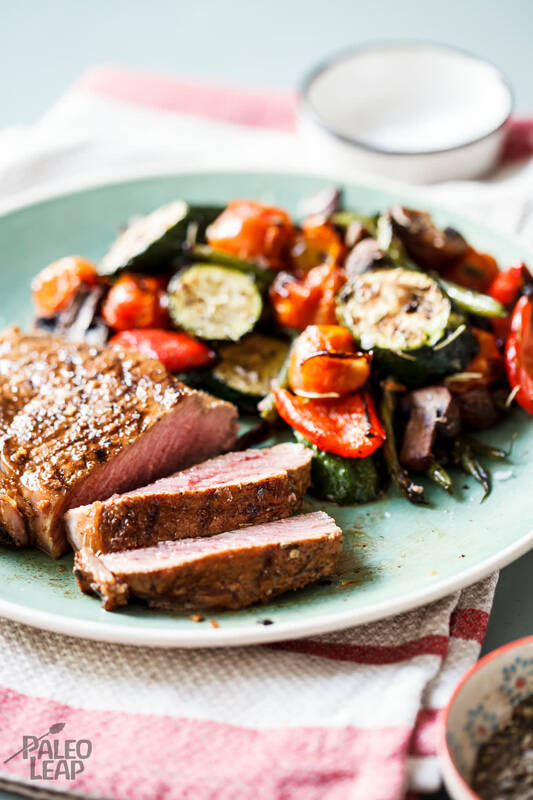 There are many food combinations that fit the bill of “oven and stove top”, yet these garlic and lime steaks with roasted vegetables are a profound starting place. If your Paleo kitchen lacks a cast iron griddle, now is perhaps the time to invest in one. It will come in handy for more than one meal, if not thousands, and it is a wonderful way to add the luxury of “indoor grilling” so that every steak will come out perfect, no matter what the weather. If you already own one, then dive right in and halve your mushrooms, deseed your peppers, trim your green beans, slice your zucchini and set them all to roast in the oven with olive oil and spices. Ah: don’t forget to marinate your steaks for 10-15 minutes before setting them on that hot griddle! This is a complete meal on its own, it requires nothing more… well, maybe it necessitates a sweet potato brownie for dessert – some meals do. Juice of 2 limes, approximately 4 tbsp. Combine all the vegetables in a bowl, add the oil and seasonings; then mix well. Transfer to a roasting tray and place in the oven. Allow to roast for 30-45 minutes until the vegetables are cooked and starting to caramelize. For the steak, combine the oil, lime juice, garlic and seasoning in a small bowl, then pour over the steak. Allow the steak to marinate for 10 minutes, then cook on a hot griddle until done to your preference. Allow the steak to rest for a few minutes.